commented on "Thunder and lightning couldn't stop the centennial celebrations of Nelson's Cawthron (Church) Steps on Friday 20 September 2013. ..."
Thunder and lightning couldn't stop the centennial celebrations of Nelson's Cawthron (Church) Steps on Friday 20 September 2013. The planned centennial event on the steps had to be transferred at the eleventh hour to Nelson's Christ Church Cathedral when the storm exploded over the city in the middle of the afternoon after a morning of sunshine. However, those who ventured out in the rain and into the cathedral enjoyed a lovely commemoration organised by Judene Edgar of the Cawthron Institute Trust Board. Unfortunately a group of 100 children from Nelson Central School couldn't make it in the driving rain to the cathedral to launch 100 balloons as planned, the Cathedral choir sang beautifully and a group from Nelson College gave us all a taste of the rousing haka performed by the school in 2011 for the opening of the Rugby World Cup. The Hon. Nick Smith, MP for Nelson, was master of ceremonies, welcoming various guests and speakers, including the Minister of Arts, Culture and Heritage, the Hon. Christ Finlayson, who spoke of Nelson's many heritage assets and the measures undertaken by the Nelson City Council and New Zealand Historic Places Trust to protect the steps for future generations. Bob Dickinson, the chairman of the Cawthron Institute Trust, spoke about philanthropist Thomas Cawthron and his legacy of gifts to the city, including the steps that bear his name. 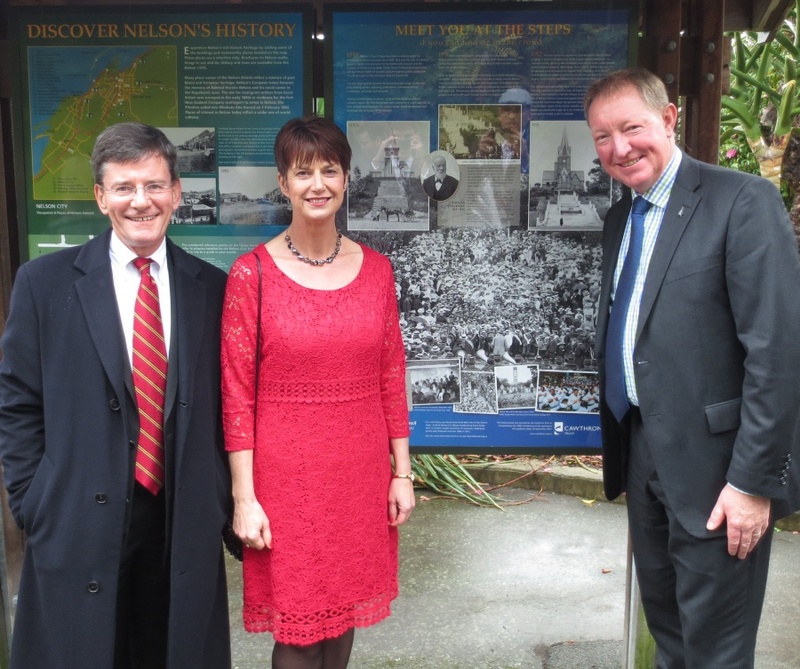 The Minister later unveiled a new heritage panel about the history of the steps at the foot of Church Hill, close to the WWI memorial statue, based on the research of Karen Stade, whose book, Meet You At The Church Steps - A Social History of a Nelson Landmark, was launched the same day. She is seen here in front of the plaque with Chris Finlayson, left and Nick Smith, right. Meet You At The Church Steps is available for sale through theis website, or from Nelson Provincial Museum and Nelson and New Zealand's top independent bookseller, Page and Blackmore.